Cholwell Riding Stables are set in a beautiful valley off the A386 between Tavistock and Okehampton, just outside Mary Tavy. They have 36 horses, are a family run business with over 40 years experience they are open all year round 7 days a week and can cater for all abilities. We took our girls down to the stables and passed the magnificent Wheal Betsy tin mine. We were greeted by the lovey Donna who then helped us get our hats and gloves on, all included in the price. The prices range from just £10 for pony rides and a very reasonable £24 for a full hour and £42 for a 2 hour adult horse ride. More details and larger party information can all be found on their website. Our daughters aged 2 and 5 had an amazing time. The staff were friendly, helpful and chatted to the girls all the way around on their pony ride. I was more than impressed with the staff as my youngest was a little unsure at first but by the end she didn’t want to get off of her pony, a great introduction to riding by her instructor Caley. I also dread to think how many questions my eldest asked her instructor Amelia, my daughter now knows lots more than she did before about pony’s and riding. She also trotted a little a couple of times, without a doubt this was her highlight of her time here at Cholwell. Myself and my partner followed behind on foot and I can’t tell you how much we enjoyed watching them on these two gorgeous little ponies Lucky and Mercury. The ride started at the stables down a lane passing the Wheal Betsy and then headed straight onto the Moor, which this farm benefits from direct access to. We then headed back to the stables where the girls had a chance to groom and feed the pony’s a little snack. 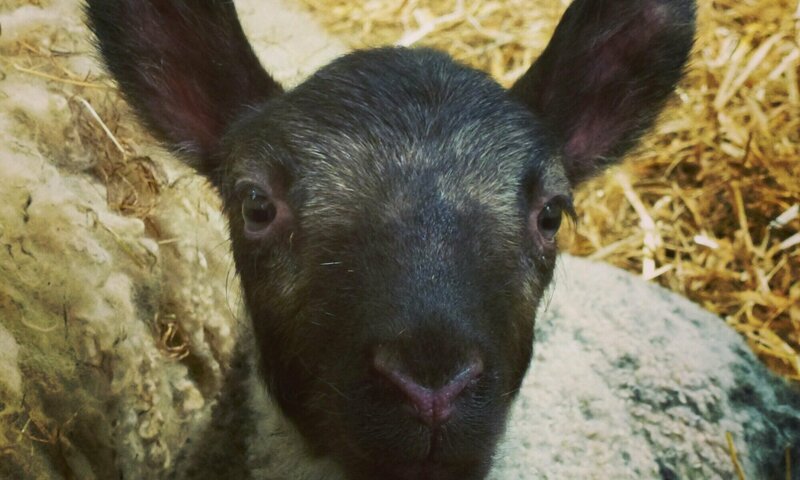 They also had some adorable young lambs outside the farmhouse and the relaxed atmosphere was very nice, we also had a couple of people comment on how happy our children looked. Making it an overall fantastic family experience. Something we will most certainly be doing again, and next time I will also be having a ride! We all can’t wait to get back there and I am certain my girls we be talking about it for months to come. A great big thank you to all that were involved and especially Dartmoor Accommodation for organizing this for us. We would highly recommended these beautiful stables, staff and great natured animals. Just fascinating… I felt very privileged today to join the people from History Hunters, Lustleigh Society, The Woodland Trust, Natural England and the Dartmoor National Park Authority on their field trip and archaeological dig at Vinnimore farmstead, nestled in the Becka Brook Valley near Lustleigh on Dartmoor. The excavation of Vinnimore Farm forms part of Lustleigh’s Parishscapes project that in turn falls within the “Moor than meets the Eye” heritage lottery funded Landscape Partnership scheme. I had a great day out and got to meet lots of interesting people with an incredible wealth of knowledge. I learnt more in those few hours about how to read the landscape and investigate settlements that I ever expected I would. To go out alone for four hours without kids was in itself a novelty, but the chance to learn more about the environment, look around somewhere new and get my camera out without a little person pulling at my leg was a delight. I have been very interested in archaeology and conservation for a long time so this really was a great opportunity for me and I thoroughly enjoyed listening to the guides. There is a lot going on down in the valley at the moment so I will not attempt to detail the history, but I will add all the appropriate links for those of you that would like to know more about the dig and their findings. There is an open day tomorrow for a chance to go and have a look for yourself and meet the friendly team. I would highly recommended taking a look before they back fill the site. It is a great chance to let your imagination run wild, wondering about what life may have been like all those years ago. On another note it gave me a change to try out my new daysack! Which I have not been paid to tell you is great. A comfortable 18 litre Lowe Alpine bag with the bladder insert for me to drink whilst on the go. A handy headphones hole, a clip to hold to my valuables securely in a safe dry pocket. Even holes to place walking poles into, all easily adjustable and even comes with an emergency whistle carefully hidden in the chest strap. A great bag. Enough about my new bag. Having the right gear for a hike is an absolute must and it really does make it all the more enjoyable when you are wearing the correct footwear and slightly pricey but essential good socks! It was a blissful and educational walk discovering more of the amazing Dartmoor National Park. I will now be keeping my eyes peeled for more opportunities like this and hope that it will inspire others get involved as well. I can honestly say after today I will be able to look at the landscape with a more open and inquisitive mind, as there absolutely is, more than meets the eye! I am having the best time blogging, it started off just as a little hobby and has now turned very quickly into something much bigger. When I started blogging I really had no idea what to expect or how to even use twitter! I now have lots of followers and my Instagram is also growing rapidly. I honestly wasn’t sure if blogging was going to be for me but I am really pleased that I started writing, and I’m pleased that my hard work is paying off. There is a great community of people out there to connect with and I am now enjoying loads of opportunities. 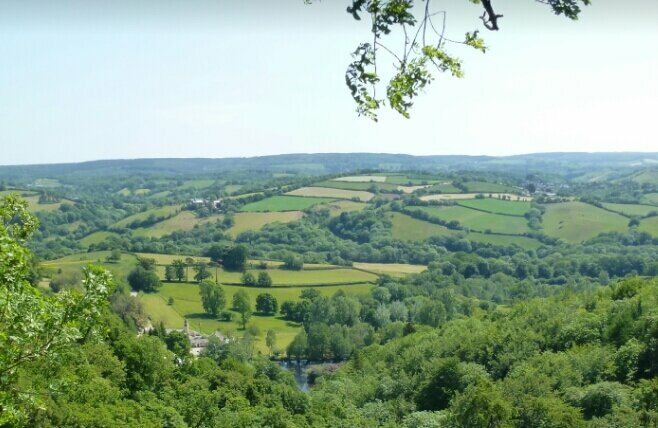 I am now working alongside dartmooraccommodation.com and I have already reached goals that I thought would have taken me years to accomplish and I am over the moon to be a part of it. I do want to try and be as organic as I can as be, and keep on blogging for myself, just to keep my own basic natural flow up to date. I recently read a post by the Honest mum that was really inspiring, on which she reminded her readers to keep being themselves and how that is enough. I love using blogging as kind of therapy and it feels great to write about whatever I feel like I am so pleased that people are enjoying reading them. If you asked me a year ago if I wanted to write for a living, I honestly would have laughed! I am now advertising myself as a blogger and I have never enjoyed something so much. The other things I have found myself liking through the life of twitter, have also surprised me. I have always been a creative person, but I didn’t realise just how much until now. I am now passionate about art and all things crafty, especially anything that’s from natural materials or artwork and landscapes of the outdoors. I have learnt so much in the last 6 months about writing, taking better pictures, social media knowledge and it has all been great fun. I would encourage anybody and everybody to blog and record whatever your passionate about as it is a really positive creative outlet for me, and not one I plan on stopping any time soon. I am now starting to allow myself to have goals that I never even thought were possible from little old me! Whilst Dartmoor is my passion and home, whilst clearing my mind on another beautiful walk, and walking in these outstanding open spaces will always be my real therapy. I am now going to start opening the doors to more creative things, such as the world of natural art and see where this also takes me. This is just my way of trying to open my eyes to all the positive things that are all around us, a way of reminding myself and whoever reads this to value all the natural beautiful things around you and remember to enjoy all the little things. Something great is just around the corner. I am not one to toot my own horn but we are officially now pros at caravanning with kids. This is not a small undertaking I can tell you as unlike just packing everything that you need for a holiday i.e. clothes, smellies, medical products you may need and some that you probably won’t need, but you take them anyway “just in case”! You have to pack everything except the kitchen sink when caravanning. I have now got a solid routine where I work through one room at a time, and I start packing the day before. Working my way around the kitchen for bowls, knives, forks, saucepans, kettle and plates. Oh and cleaning products, I forgot the washing up liquid though this year but I did remember the tea towels (the one thing I forgot last time)! Then it’s onto the kids toys, I let them fill a small child’s suitcase with whatever they want to keep them busy, and its handy to grab out at the other end when your trying to set everything up. Then the usual clothes and bathroom stuff, and finally the bedding for all three beds. Madness I know but we do really enjoy it, caravans are cosy and fun whatever the weather and we really do seem to have it down to a fine art now. Without sounding too victorian, I do the inside homely stuff and he does the outside bits like water, electric, gas and putting up the awning. This works for us. We travelled down to Cornwall and arrived at our favourite spot in Hayle, the caravan club site is perfect and well maintained with lovely staff. You do have to pay a yearly membership for these sites but it is well worth it as you know that everything is going to be of a high standard. There’s a lovely play park, you are surrounded by sand dunes and there are views to the sea. 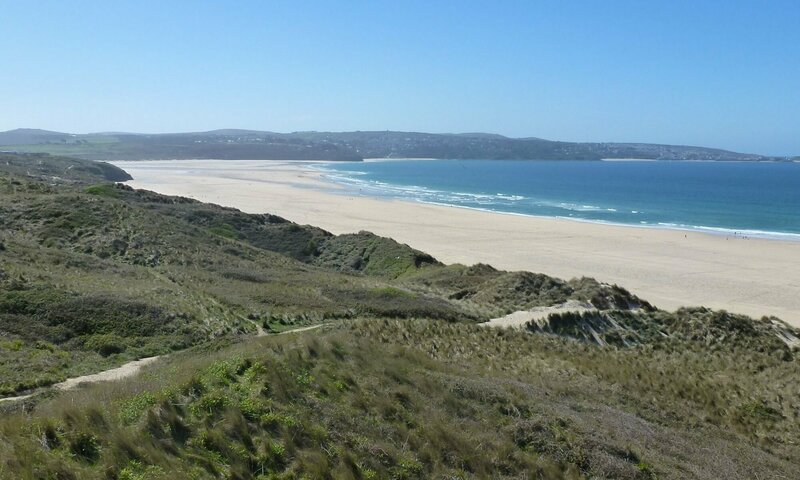 The beach is a short walk away through the dunes down to Hayle Sands which is an absolutely beautiful and very large beach. The walk itself through the sand dunes is great fun with lots of winding sandy paths, and you can also hear the skylarks singing away. We tried going off the beaten path and some of the tall marram grass made it all the more exciting to adventure through. With a little slide down the sand you then come out onto the incredible beach. My girls love being by the seaside and this is one is just perfect as there is ample room for them to run around in there own little dream lands. On the way back we also headed off to find the biggest sand dune we could, for a great final slide down the sand. View Ranger came in handy again here as we were able to locate the highest point near us. We also picked up a crabbing set on a day trip to Mousehole, a pretty little fishing village on the south coast. A great idea for keeping the kids busy for a few extra hours and you can pick up the crabbing kits for as little as two pounds. With more playing on the sand, a picnic and an ice cream later, we had another lovely day out. On the site there was also a kids treasure hunt with clues which they called the tourer explorer trail. Another freebie to keep us busy for an hour or so before dinner. We looked for clues in the grounds of the site with the help of a map and finally got a prize at the end which the girls were very happy with. We also did a trip to Porthcurno another amazing beach with views up to the Minac Outdoor Theater. This beach is something we stumbled on whilst walking some of the south west coastal path towards the Minac. We walked around the top of the cliffs and couldn’t believe how beautifully clear the water was below us and how light the sand was. We got back in the car and drove down to this beach, you really could of been anywhere in the world, we were stunned. We also recommended the hot food boxes outside the theatre entrance, no further directions needed on this one… just follow the gorgeous smells. The sun shone most of the time, it was a little cloudy on our first day but after that we were very lucky with the weather. My eldest had plenty of time to practice her bike riding skills and to meet new friends. We even managed to keep the Easter eggs hidden out of sight until the Sunday when the Easter bunny arrived in the awning! I know caravanning isn’t or everyone but the beaches I have mentioned are well worth the trip to Cornwall. All in all, minus the washing up liquid and the four hours stuck in traffic on the way home which we would all rather forget about… It was a successful trip and we thoroughly enjoyed our time there. Are you ready? Here’s a snippet from my crazy life as a mummy of two little explorer’s, and partner to a gadget mad adventurer. 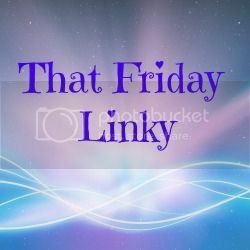 I want to start this week with a huge thank you for all the lovely comments and retweets of my blog post and pictures. I’m very excited about what blogging is doing for me and my family. Not only is it an outlet for me to enjoy, my family are benefiting from the opportunities I have been given so far. Most of all it seems that people are enjoying reading about our family adventures, and I’m really pleased, so thanks again. We started by putting the bread maker on in the evening so that we had a fresh loaf ready to make our sandwiches in the morning. All was going quite well in the morning until I realised that the sun was beating down, (not that I am complaining) but I hadn’t seen the sun cream since last year, or the girls sun hats! Eventually we had packed everything we needed into the carrier and we got into the car a few hours later than we had originally intended. We always have grand plans on a Friday night to shoot out early on a Saturday morning, and than we remember that we have been running around all week with work and school runs and this is our only time to get up a little more casually. 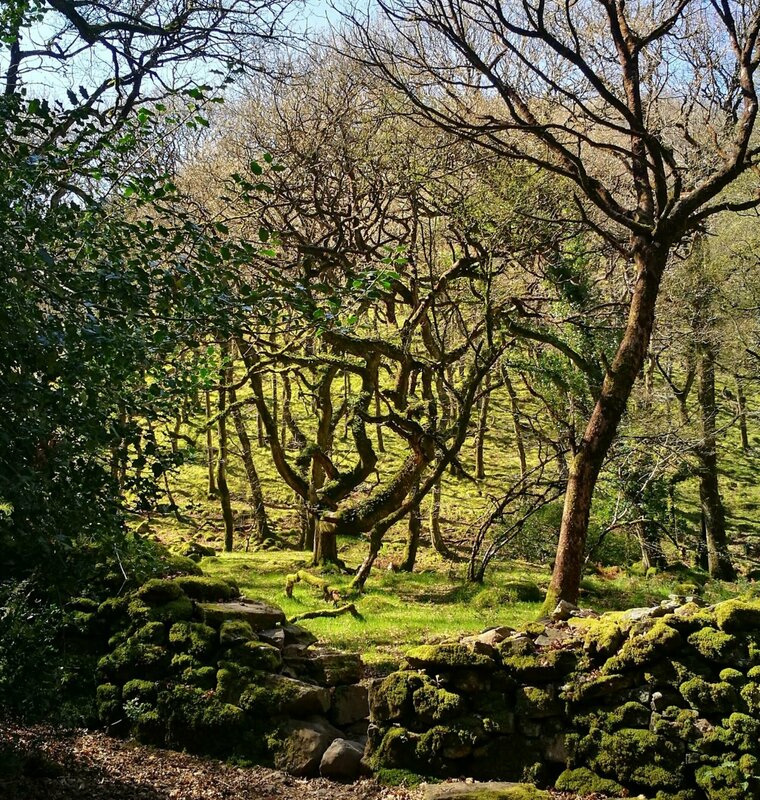 We headed to Okehampton to do one of our favourite walks up the East Okement river. Its beautiful, first you cross through fields then under the old railway viaduct and underpass. You cross beautiful bridges and wonder through woods, that at the right time of year are filled with bluebells. There’s lots of spots to throw stones into the water, you have to cross stepping stones and climb narrow winding hills. At the highest point of our walk there is a breath taking waterfall before you drop down the other side to come out onto the moor for a fantastic half way picnic spot next to the river. My eldest is five and she managed the whole five mile walk on this day. I was so impressed with her, this is quite a hard going walk, and she was a little trooper. We did have a “fly in the eye” incident, and rather dramatic “the puppy just wants to play with you” situation. My dear daughter had clung on to stick that she found along the way, dog owners probably won’t need much more information but the puppy came bounding at my five year old thinking she was going to throw the stick. Totally my daughter’s own fault as she ran away screaming with the stick still in hand, the puppy was extremely excited by all the commotion. We did eventually separate the puppy and child tug of war. No harm done and luckily the owner seemed to find the whole thing just as amusing as I did. Lesson learnt! We then had our lunch and a little paddle in the water, a little chilly, but refreshed our feet nicely for the journey ahead. We were then ready to climb up on to the moor and head back to our car, home and bed. We used view ranger to map our walk on this occasion, brilliant if you also have a smart watch as the compass is so accurate, your watch will actually point you to your next waypoint. Great for those who like to go off the beaten track. Next day, up early “ish” again as we have family down from London at the momen, so we were off to visit them in Dawlish for a morning at the beach. I grabbed a towel to dry any wet toes that may be dipped in the sea. As I am writing this I still can’t believe that I actually thought one towel would of been enough, you would think I’d know my children better than that by now. Both of them were soaked head to toe, they were having so much fun running in the shallow water and jumping over waves that I didn’t have the heart to tell them to stop. My poor youngest had to be stripped off and a new nappy put on, the places she has had her bum changed in the last few days is quite comical. We have had bum changes on the moors, in the car boot and now on the beach, there really is no dignity in being a toddler. New nappy on and wrapped in my jumper we had to get her and the eldest which was wrapped in the one and only towel up to their Nanna and granddad’s, whilst me and my partner walk barefoot along the road until the sand dries on our feet, again because of the lack of towel problem! We then did have a very relaxed afternoon and nice family meal with the in laws. With very sleepy children we headed home around six that evening. The youngest asleep in the car with a banana in her hand after about thirty seconds of driving. From the moors to the beach in 48 hrs, this is why we love Devon and Dartmoor. We were most impressed with our visit to this truly beautiful spot. There is so much more to do on the estate than just see England’s highest waterfall. It is in a lovely setting with surrounding meadows and lakes to walk around and lots of places to have a picnic. The meadows are filled with gorgeous flowers and there is of plenty of wildlife to be seen around the ponds and lakes. When you get the entrance there is also the chance to hire a carrier for your little ones, as the track up to the top of the falls is not buggy or wheelchair accessible. The carriers are also equipped with sun shades, perfect for a hotter day. Its a nice climb up to the top with many great view points. When you reach the top, the buzzards view point is stunning and well worth the 400ft climb. There are also lots of parks and activities to keep the children busy including a zip wire and trampolines. There is also a nice cafe next to the shop and entrance. We only visited here for a couple of hours but we could have definately made a whole day of it. A great little adventure, and a lovely family achievement when you have made it up to the top of the waterfall together. Another day, another ramble on trusty Dartmoor with the family. Starting with the usual gathering of ideas from our “Dartmoor short walks for all the family” book. A book by Crimson in their short walks series, a very well used and trusted family favourite of ours. These Crimson books include all the essential family information, including picnic areas, where to get refreshments along the way, and toilets! 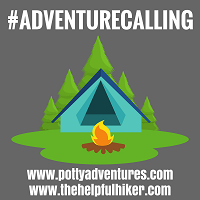 Quite handy, but we do try to gather all the essential picnic foods and drinks from home before going out on our adventures on the Moor. This walk took us to the north moor, near Gidleigh. We parked up then walked onto the Moor and down to the Scorhill stone circle. 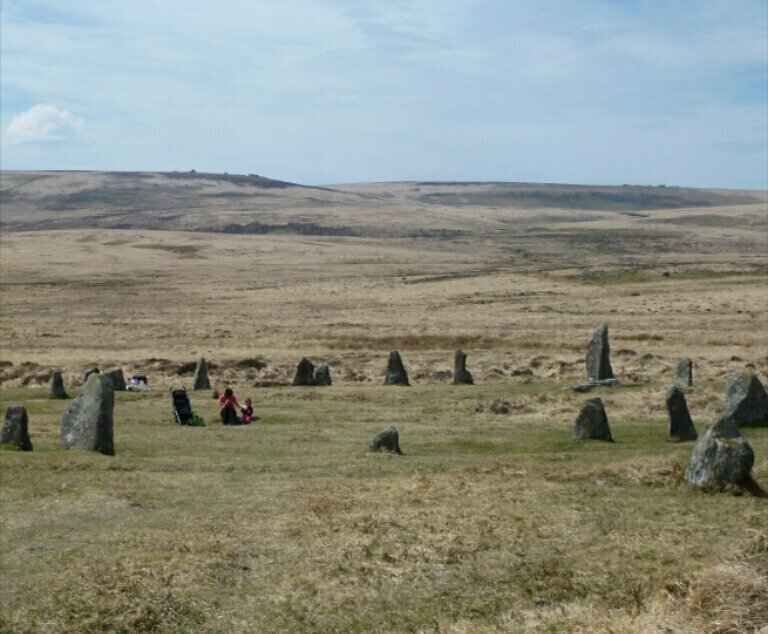 A very impressive stone circle of around 30 large stones with a diameter of around 28 meters. Doughnuts were our Sunday treat today, having already had our lunch, we sat in the middle of the circle for a little dose of sugar before we attempted the hill up to Kestor. We actually forgot the carrier for our youngest daughter on this occasion and ended up with a mostly empty buggy coming along with us. Luckily it was the light weight buggy that was left in the car and not the industrial all weather pod, that I use in the week for the school run. This isn’t a particularly buggy friendly route so I would advise a carrier on this one, I would actually advise a carrier for anything on Dartmoor… But needs must and off we went up the hill! The lovely Kestor is a great tor with an amazing view from all angles. It’s also hiding a hidden secret at the top, a small pool of water known as a rock basin. For those of you who like a bit of more about the legends of Dartmoor, this basin was said to have been used to catch the blood from those who had been sacrificed by the Druids. That I’m afraid is the extent of my knowledge, as that’s what it said in the book! There is though a great website, www.legendarydartmoor.co.uk with lots more information. So with our sugar rush coming to an end, and a few more quick snaps to remember the day, we headed back down to our car. All in all our bimble was around 2 hours… A perfect little adventure to wear out the kids before dinner and satisfy our need for a bit of fresh air. My latest blog can now be seen on the Dartmoor Accommodation website. 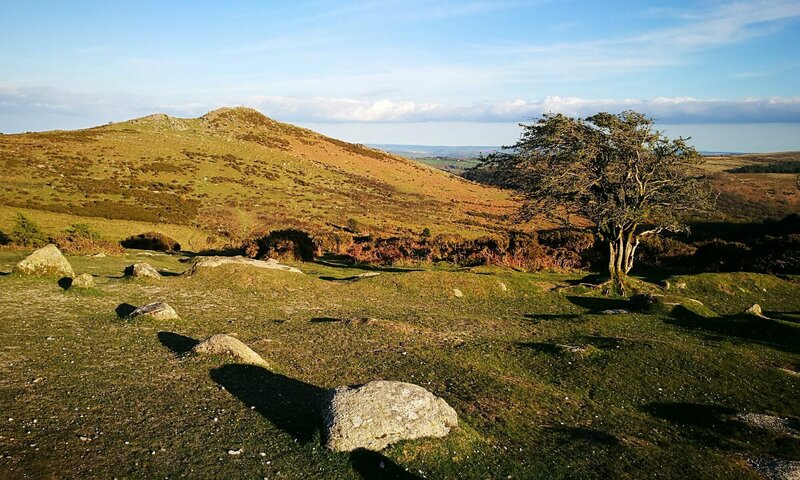 Things to do in and around Dartmoor with your family this Easter. Have a lovely family Easter.